PhotoMath Camera Calculator: Making Mathematics Easy? Today ads on educational apps are popping up every now and then. The current scenario of education is changing its face too. So an app that could address the problem of mathematics would be something which everybody would be waiting for. For me, mathematics is a subject for which I need help from every corner I could get. To avoid the embarrassment of asking people the simple calculations, I was searching for an automatic solution from the Play Store. A list of apps got listed out of which the name "Photomath" grabbed my attention and I just gave it a try simply for the heck of it. I wanted to see if it is going to be of any help to my little one with his math homework with a step by step guide to solve mathematical problems. The app says that it is specifically crafted to help students with their home assignments in maths from the smartphone. It will give step by step instruction towards a mathematical solution teaching them how to do it. More than letting the student get the help, I wanted it for myself to check whether what he is doing is correct and needs to be done the same way. Looking at the app what appeared to me at a glance was that, the app has an interesting appearance with all its functionality at place. But when I started using it, I felt it could be more complete and recommendable if it includes some more features and trim off some flaws that are still lingering. 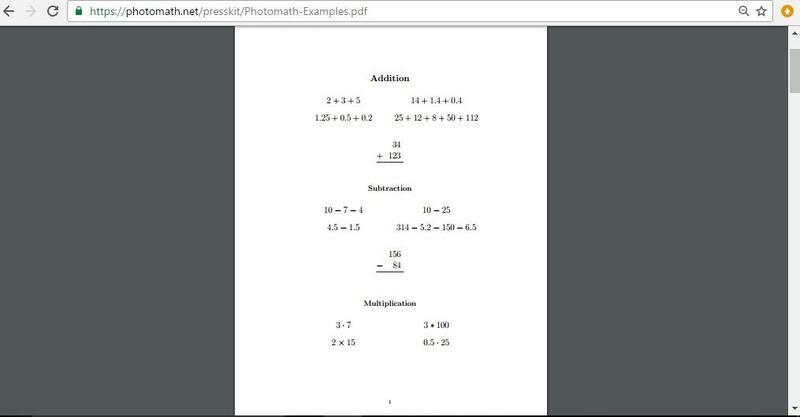 PhotoMath is primarily a program where there is a camera which is used for solving equations. To start with, the students need to point the device at an equation and then after waiting for a few seconds the equation would start getting scanned. It's then, when the solution would automatically appear on the screen. Here one can tap on a button to have a look at the steps which are to be taken to solve the problem. There would be several icons on the main screen like the icon that lists all recently scanned equations and their solutions, the information icon and the brightness icon. There is a highly responsive camera calculator. They provide you Step-by-step solution to major mathematical kinds of problems. Problems of algebra, trigonometry, integrals, and derivatives are also included but currently one has to work without much detailed step by step solutions but they announced that they would be coming in near future. If we have to go ahead with the teaching methodology, then any app like PhotoMath ca be one such bigger step towards it. It is more like an instructional tool that can be used on a big screen for the entire class. Now the older methods of hand written calculations on heavy exercise books can be smoothly replaced by this hand held app where the communication between the students and the teacher can be recorded at every step and all the steps of mathematical calculations can be repeated as many number of times without making the students feel embarrassed about it. PhotoMath is an app that is based on simplicity and it has got an intuitive design that goes perfectly well with its responsive interface. The UI is non-messy with a prominent focus on its functionality which I liked the most. The idea of taking snaps of a math problem is simply unique and loading down the solution with a step by step instruction is just magical. The app does not even ask you to take the snaps in that sense. It is only that a math problem has to be fed in the given field, and the app will automatically scan it to come up with the steps of the solution. A number of times, I found that the PhotoMath App is struggling to identify a few elements. It does not support hand-written stuff but only printed ones. Sometimes I found the app giving simply wrong solutions to the problem, as it could be the case that it could not detect the elements of the problem itself and is holding them to be something else. So that is the primary bug that the app is currently facing, and once this gets addressed, the rest could be automatically corrected. The other thing that crossed my mind that kids can misuse the app and look for a quicker solution to the math problems without actually learning the steps and understanding the methodology. But then there has to be a human monitoring where such things doesn't take place. The app still needs the following to become a regular teaching aid and come handy at all levels. The app needs to detect the problems at a single attempt. It needs to include more kinds of mathematical problems. It should have options to even create more exercises for each type of mathematical equations. There should be a feature like "try it yourself". There should be an option to show the corrections, where the students are going wrong, something like "auto correct" feature we get to see in Word. To give a frank opinion, th PhotoMath App as of with the current scenario is a giant step towards changing the teaching methodology and reducing the fear-factor of Maths with a fun-learning attitude. But it has to walk a long way to be recommended as a regular teaching aid for the schools, teachers or even at home. The detection process needs to be flawless to make the app dependable enough. But above all, it has to be understood that no app can replace the value of a teacher who teaches the students understanding the human mind and its tendencies. But as far as technology is concerned, it has always gone ahead adding up better solutions to the problems that the earlier methodologies had to face. 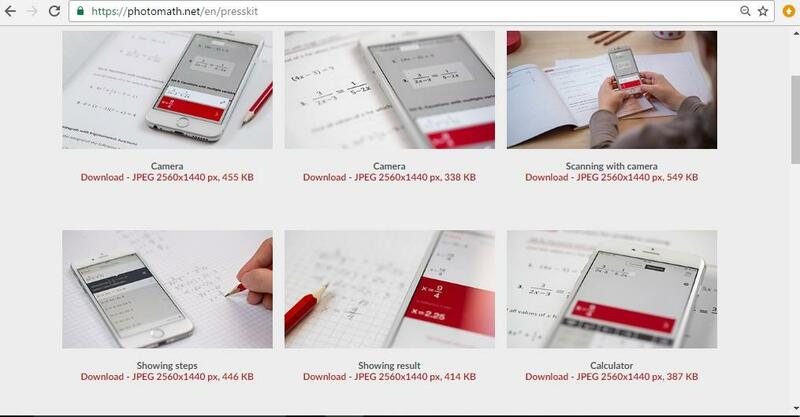 From that point of view PhotoMath is undoubtedly a smart solution to the mathematical problems solved with the help of a smartphone.